Comfrey oil is perhaps the best oil to have on hand in your herbal kit and is a very useful oil to use as a base for salves. Heals about any kind of skin problems, scratches, rash, diaper rash, bug bites (specific for spiders) and shallow wounds. 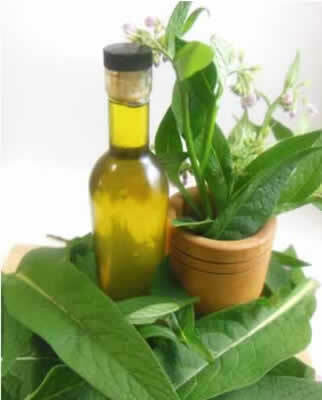 Comfrey oil also eases the pain of arthritis, muscle aches and soreness. Recipe Instructions: Herbal Oil Infusions :Infuse in olive oil with a steady low heat (110 degrees) for 2 to 3 weeks. Strain and pour into clean, dry bottle.